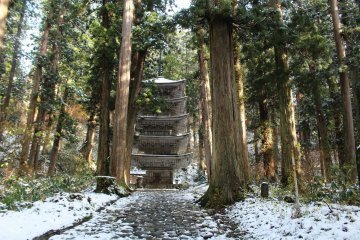 Dewa Sanzan is the local name for the three sacred mountains of Yamagata Prefecture, in the Tohoku area of Northwest Japan. The presence of these storied mountains has long had a strong spiritual impact on the locals living in this once secluded area of Japan. A temple that honors Shugendo mountain worship, a mix of religious traditions from Shinto and Buddhism, was placed near the summit of each mountain over 1,400 years ago. Ever since, Dewa Sanzan has acted as a religious crossroads for pilgrims and travelers from Japan and more recently all around the world. To appreciate Dewa Sanzan, we need to understand Shugendo and the Yamabushi (mountain monks) who practice this religion. Shugendo evolved from local folk-religious practices in the seventh century Japan and has adapted to the modern age taking in an amalgamation of beliefs from Shinto, Taoism, and Buddhism. The religion is loosely translated as "a path of training to achieve spiritual powers." Practiced by mountain monks, known as Yamabushi (those who rest in the mountains), Shugendo involves acts of marking mountain trails, endurance under extreme conditions (think cold mountain waterfalls), dietary focus and engaging in long periods of silence and seclusion. Long ago there were even monks who would seek to become living Buddhas through a rite of self-mummification. One of the best parts of visiting Dewa Sanzan is that tourists have the opportunity to become a Yamabushi in many ways. 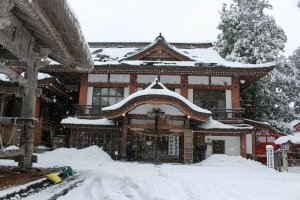 This includes eating the Yamabushi vegetarian diet of mountain vegetables and local products (shojin ryori), participating in hiking experiences led by actual Yamabushi guides to the mountain temples of Haguro, Gassan, and Yudono (the three mountains of Dewa Sanzan), and staying overnight in lodging specifically designed for mountain monks (shukubo lodging). 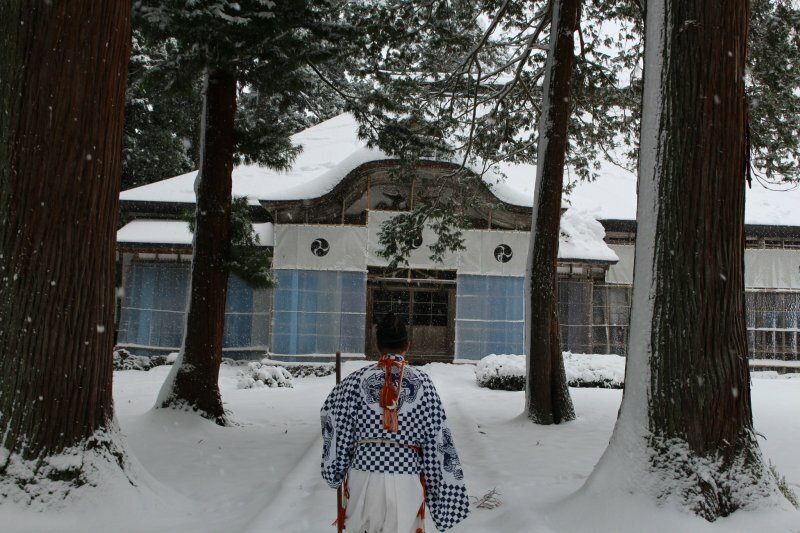 One of the most memorable things you can do in Japan is take the path up Mount Haguro in complete silence in a group fully dressed in Yamabushi attire. For those who are truly passionate about spirituality, there is even a week-long initiation held in August where visitors may live the life of and be ordained as a Yamabushi monk (complete with renewed perspective on life and a stylish new monk name). The attraction points of Dewa Sanzan fittingly revolve around the three mountains. This can be simplified further by stating that the majority of foreign friendly and accessible experiences are centered around Mount Haguro, the smallest of the three mountains of Dewa. From the "Haguro Center" bus stop the surrounding area includes several attractions. The following can essentially be followed in order of activity. Ideha Museum - A great starting point with plenty of English materials, interesting displays. 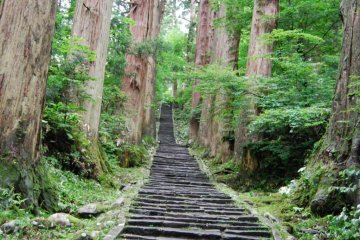 Here, tourists can borrow the white Yamabushi clothing and a walking stick for the path ahead. 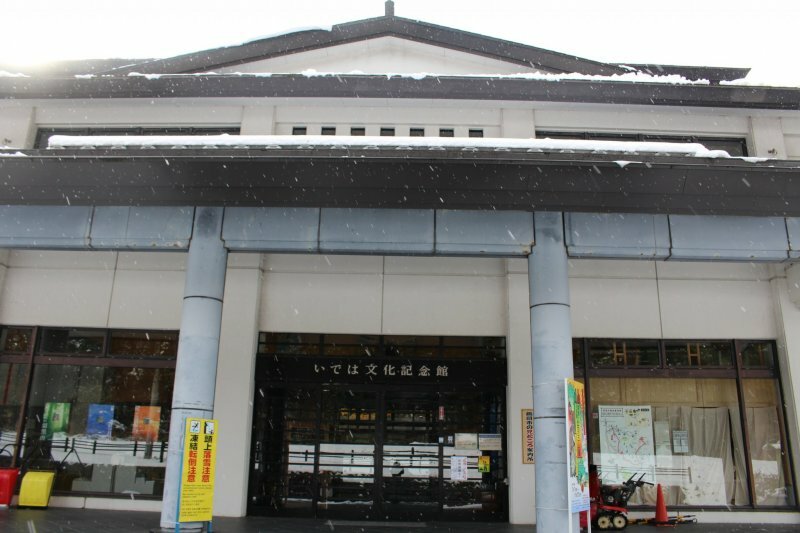 There are Yamabushi monk guided tours that start from Ideha Museum, but you will need to check and reserve in advance. Goju-no-to - A refreshing walk from Ideha Museum of approximately 15 minutes. Along the mountain path you will find 33 stone figures (good luck if you find them all!) and 2,446 stone steps that lead to the summit. First, however, you will pass a torii gate entrance, cross a bridge and waterfall, and come upon Japan's northernmost five-story wooden pagoda temple, Goju-no-to. 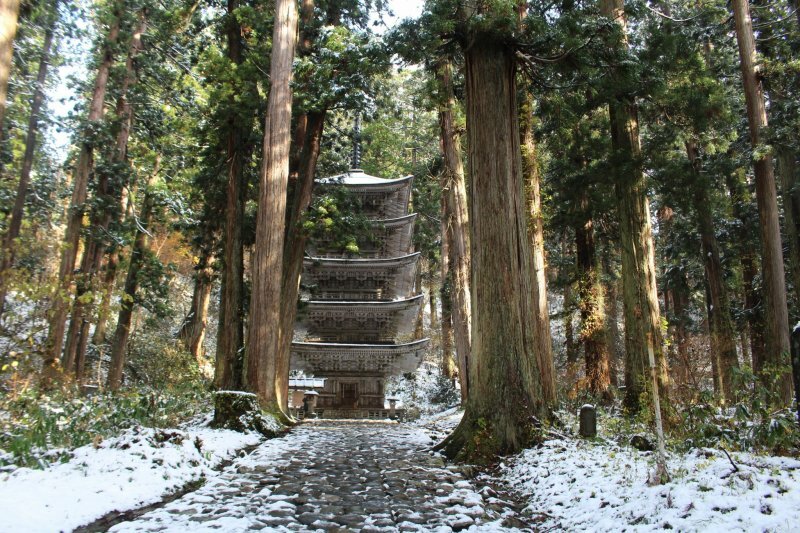 Built over 600 years ago, this is the first stop along the path to the summit of Mount Haguro. 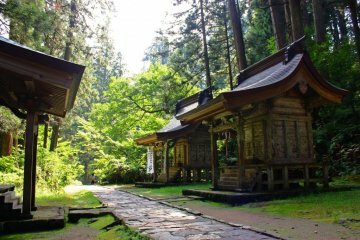 Surrounded by towering sugi cedar trees, this is one of the most beautiful points of Dewa Sanzan. Be sure to check out the massive sugi cedar tree just next to the temple that outdates the temple itself. 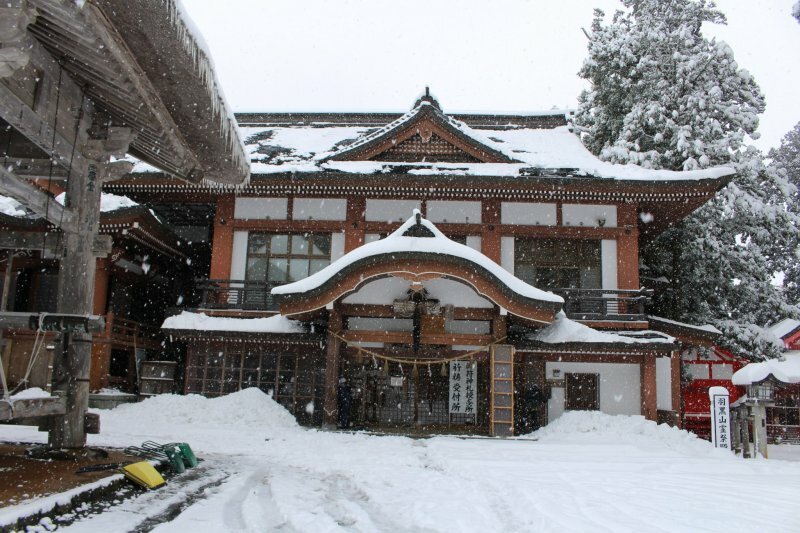 Sanzan Gosaiden - This is the main temple building found at the the summit of Mount Haguro. 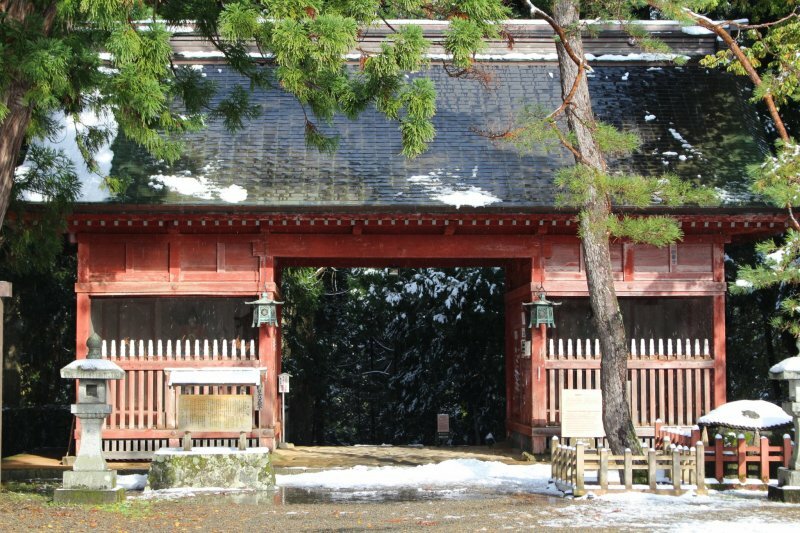 Sanzan Gosaiden is the most important temple in the region in terms of location and significance. The building is connected with several attached corridors which can be explored with or without a monk guide. 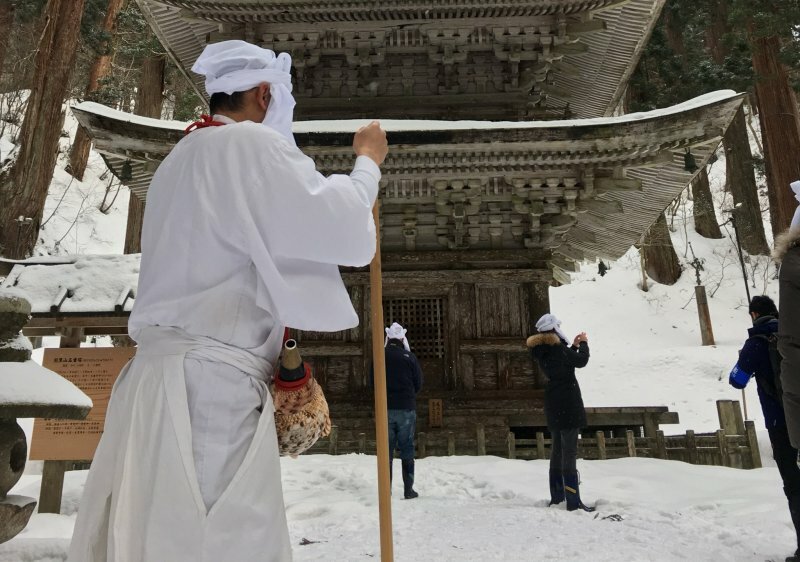 If you do have a guide, you can participate in purification ritual and listen to the chants and booming shell horns carried by the Yamabushi. 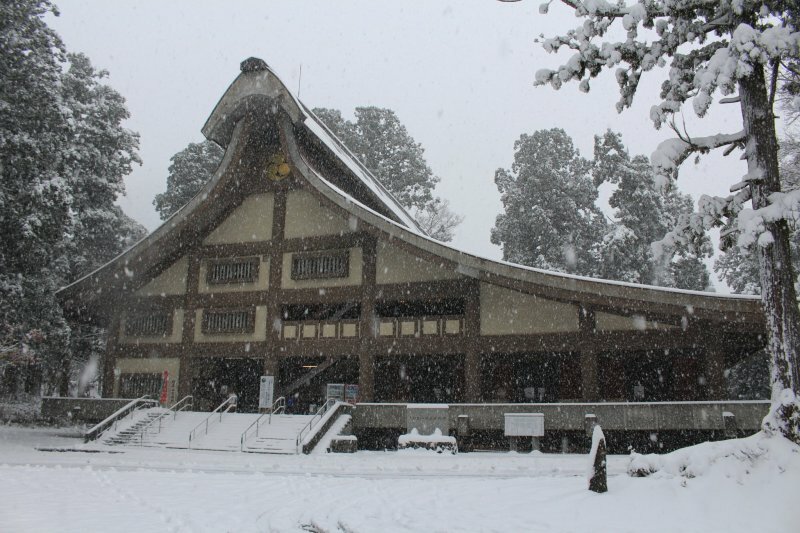 The main building has the thickest thatch roof of any building in Japan. The Dewa Sanzan Historical Museum is located nearby as well just a minute or two on foot from the temple buildings. 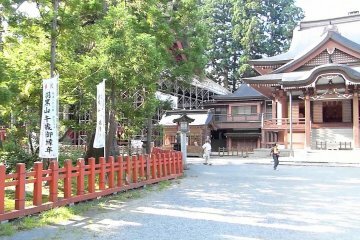 Saikan Shukubo - This monk lodging is just downhill from the main temple buildings and a few minutes walk. 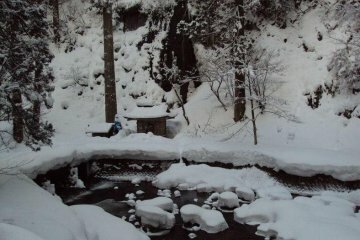 This shukubo is one of several in the area and is certainly the most convenient if you are planning to stay the night in the area. 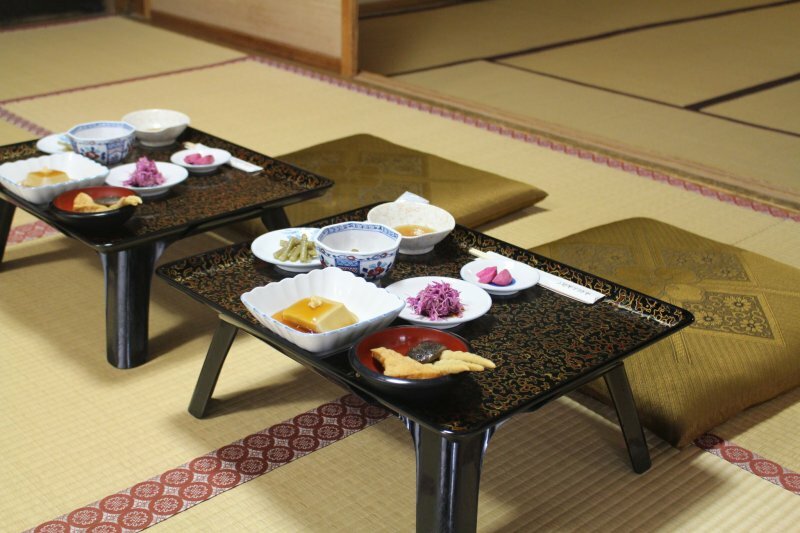 Saikan (Japan Travel article) is one of the most popular lodgings in Dewa Sanzan so do book ahead of time. The food served is 'shojin ryori', following the Buddhist concept of killing no animals, and there is a hot bath available in the evening. Rooms are modest and consist of tatami flooring and futon bedding. Mount Gassan, accessible on the same bus route that goes Mount Haguro, is the tallest mountain of the area at 1,984 meters. There is a two and a half hour hike from the nearest bus stop to the summit of Mount Gassan where Gassan Temple is located (500 JPY entrance). Mount Yudono can be reached by continuing from the peak of Mount Gassan for another hour or so. 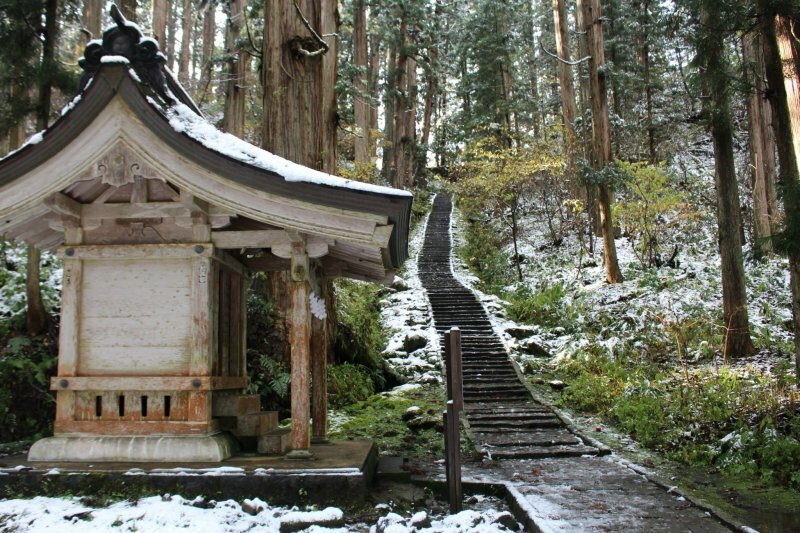 If you keep going an additional hour and a half through somewhat steep and rugged mountain hiking you will eventually arrive at the Mount Yudono Temple, the holiest temple of the area where pictures are forbidden and only those who have visited know its mysteries. 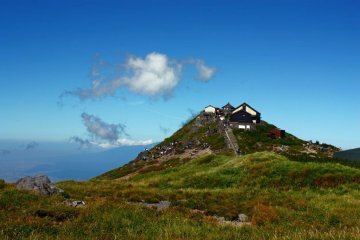 It should be noted that the climbing season for Mount Gassan and Yudono lasts from July to mid October. This is also when you will find many pilgrims traveling the area which increases the appeal. 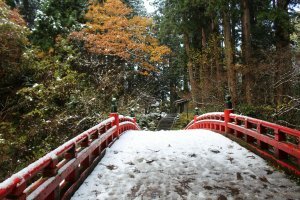 Mount Haguro and the surrounding area is accessible throughout the year, including a beautiful winter environment. 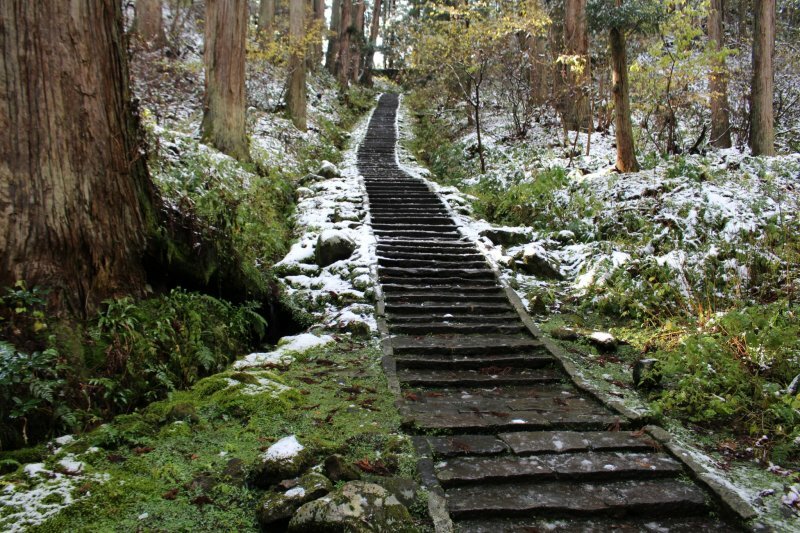 Note that the stone stairs can be slightly difficult to climb in the winter without snow shoes. If you are interested in the nature of the area, be sure to check out our article on the connections between nature and spiritualism in Yamagata. Getting to Dewa Sanzan is a short journey from Tokyo. Shinkansen is available for JR Pass holders and will be around four hours from Tokyo Station to Tsuruoka Station. Flights to Tsuruoka are the quickest option as the flight is quick hour direct flight from Tokyo for around 10,000 JPY or potentially much cheaper with the JAL Explorer Pass. Night buses are an option as well for those on a budget. Buses run from Tsuruoka Station to the top of Mount Haguro (approximately 40 minute ride) and the base of Mount Gassan regularly. A separate bus runs to Mount Yudono. 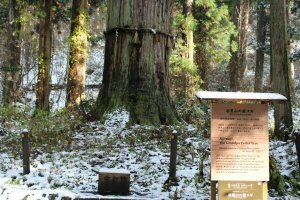 Most visitors will want to get off at "Haguro Center" stop to catch the museum and walk the trail to the summit from here. I stayed in Saikan once a long, long time ago, for the temple's New Year celebrations. 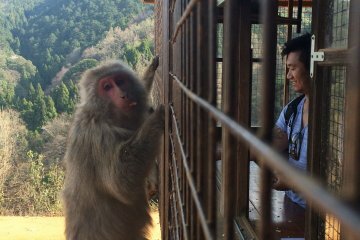 One of the most unforgettable things I've done in Japan. 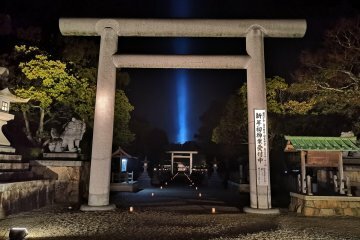 Your article brings up memories and makes me want to visit Hagurosan again. It's a beautiful and powerful place.